A full-sized replica of a WWII Spitfire being built in tribute to 71 pilots who died while learning to fly at RAF Grangemouth has had its wings attached. The event marked a milestone for the memorial, which has been paid for with money raised by current air cadets. RAF Grangemouth in Falkirk served as a major air centre until 1949, and pilots from all over the world trained there. The plane is an exact replica of one flown by a young Polish pilot who was killed in training at the base. 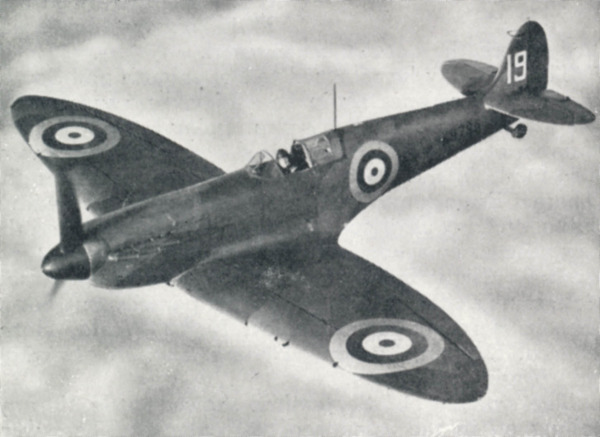 Tom McMorrow, of the 1333 Grangemouth Air Cadets Squadron, said: "At one stage there were over 100 Spitfires based here at RAF Grangemouth, and the air crew came from all over the world. "Sadly we lost 71 of them in accidents here. These trainee pilots were about to go to war to frontline units so they were learning operational flying like dog fighting and firing of weapons. So we lost that number through accidents of various kinds." The replica Mark I Supermarine Spitfire, which is due to be unveiled on 9 May, is modelled on a real plane flown by a Polish sergeant called Eugeniusz Lukomski. He died in the aircraft aged 23, in an accident not far from the airfield. Mr McMorrow said he was typical of many of the men who served at the airbase. "All of those 71 who died came from 11 different nations - Ireland, America, Canada, Australia, India, New Zealand," he said. "We chose a Polish pilot because there were so many Poles here. "At one stage Grangemouth was training every single Polish Spitfire pilot, and our cadets wanted to make the Poles the centrepiece of it." 'Fantastic achievement' Every Remembrance Day Air Training Corps cadets from Grangemouth lay wooden crosses and poppies on the graves of Spitfire pilots and other air crew who died while flying with 58 Operational Training Unit. Chairman of the Grangemouth Spitfire Memorial Trust Iain Mitchell said: "It's fantastic what's been achieved. The cadets managed to raise the money to crate the base for the Spitfire. "She will really be going home again, I suppose you could say." The Spitfire is to be installed on Bo'ness Road, near what remains of the airfield. Source: BBC Via Forces War Records Blog.